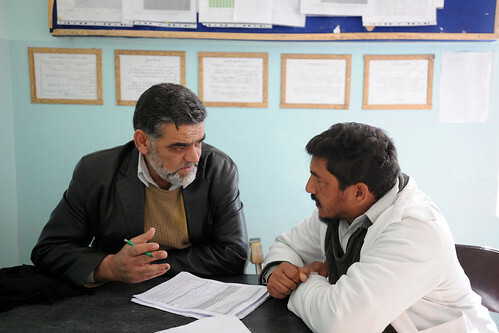 Completing an inspection checklist sent out by the Afghan Basic Package of Health Services, Farah Hospital pharmacist Nasrullah Noori speaks with Dr. Fazil Ghani, the resident doctor at the clinic, during a clinic assessment, Dec. 29, 2009. The clinic employs 14 staff members, including civilian guards, one doctor, one nurse, one midwife, a pharmacist and other administrative officials, and is open 24 hours a day. “There is always a doctor here,” said Mohammad Sarwar, an administrative professional at the clinic who has been in charge of the clinic’s logistics for the past three years. Noori travelled to the clinic in the Pusht Rod District of Farah Province, Afghanistan, with the Farah Provincial Health Director, Dr. Abdul Jabar, and other Farah Hospital medical providers; all of which were transported and accompanied by members of the Farah Provincial Reconstruction Team (PRT).